VertiRackTM is proud to introduce its' C-Rail mount surfboard / stand up paddle board rack. Upon careful consideration of our original through bolt mount surfboard / stand up paddle board rack and taking into consideration the many requests for a removable surfboard / stand up paddle board rack; VertiRackTM has designed what we consider to be the ultimate surfboard / stand up paddle board rack. This new rack design mounts to the C-Rail roof accessory rails located on the van roof and cantilevers the rack down the side of the vehicle making it a semi permanent rack. It mounts to the C-Rail using an adjustable / removable mounting block assembly, allowing the rack to be positioned anywhere over the length of the roof mounted C-Rail. This allows for unlimited forward or rearward adjustability of the rack's vertical rail location. The rack is then adjusted in angle and depth off the vehicle to provide the best fit for the given location. This newly developed cantilever design allows for the interchangeability of carrying short length surfboards or moving the rails to carry the longest stand up paddle boards. All while making the rack easily removable by the removal of one rail cap and the loosening of one adjustment knob. C-Rails, which can be retrofitted to the van at any time. This does not limit the rack's application to the Sprinter van only, as aftermarket mounting channel kits are available for most of the high roof vans currently on the market. 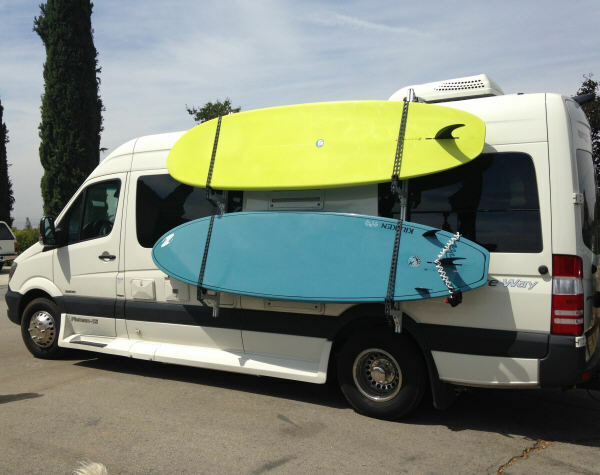 VertiRackTM Manufacturing Co. makes Surfboard Racks and Ladder Racks to fit virtually all vans, trucks, trailers and recreational vehicles.